The route is extremely easy to find/follow ... just like the name says, take Route 108 from Jeffersonville, VT to Stowe, VT.
Amazing terrain through the midst of ski country. Many scenic lookouts and hiking opportunities. Very good pavement, however beware of small sections of road with steep inclines and switchback turns. A couple of very sharp turns with zero visibility of oncoming traffic. Note: This road is a must to travel if you're in the Stowe area. But please beware of one section in this short road which is extremely dangerous. The road is only wide enough for one car while the road is steep and curvy as well as blind to oncoming traffic. Shopping, food and gas at either end of the road. 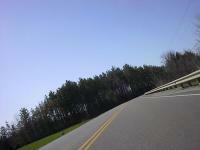 Many lookouts, resorts, and hiking trails located on 108. Photo contributed by a visitor in Apr 09 - "Stowe Vermont in the Summer"
Photo contributed by a visitor in Jun 09 - "This is one of three sharp curves near the summit on the south side of the mountain. The two curves above this one have reduced visibility of oncoming traffic"
on July 27, 2009 3 out of 3 members found this review useful. The notch is a great section of road. It tends to get bogged down on the weekends with cagers. on August 10, 2012 0 out of 4 members found this review useful. My GPS chose this road for me on a multi State tour. This is not the route to take two up, tired and overloaded on a big touring bike. The road is smooth but I have never ridden on any road before where 1'st gear was the gear of choice. on May 13, 2009 0 out of 1 members found this review useful. They dynamite the rocks in the 2 first photo, so it is'nt a launching ramp anymore!! !